Holy week begins with shouts of acclamation and high expectations. To the disciples, who failed to grasp Jesus’ foreshadowing of what was about to take place, it must have seemed that the one on whom their hopes were pinned had finally come into his own. His success would be theirs. But nothing happens. Jesus visits the temple, takes in the scene and then abruptly leaves. “Perhaps the revolution begins tomorrow,” the disciples think to themselves, as they make their way back to Bethany. The light of day does not bring the launch of the revolution either, only a series of awkward incidents. 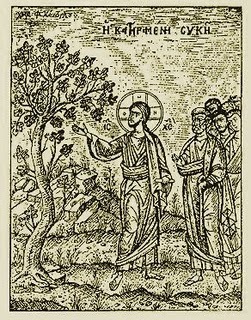 A hungry Jesus curses a fig tree on the way to Jerusalem. He visits the temple again, this time turning over the money changers’ tables and calling the place a “den of thieves.” Exchanges with the religious leaders on Tuesday prove to be testy and dangerous, as Jesus asnwers their objections and teaches under their withering gaze. By Wednesday the false momentum of Sunday has dissipated entirely. Judas has made his bargain, sealed with a promise of money. The welcoming crowd is dispersed. It is a day of silence and one cannot help feeling that greater forces are on the move. The disciples sense it growing about them, thick and still like a looming storm. And then the Passover arrives. Did they expect this to be the high point of the week? The celebration of a new Exodus? Instead, Jesus is brooding and sorrowful. His actions are strange. He interrupts the familiar Passover liturgy to wash the disciples’ feet. “You do not realize what I am doing,” he says when Peter objects. Jesus’ words are even stranger. Filled with disturbing predictions of betrayal and death, they leave the disciples shaken. And we are shaken with them. Because the rhythm of Holy Week is the rhythm of our own lives. It is a descending rather than an ascending trajectory. It is the way of death. The way of the cross. The seed must fall to the ground, if the life in it is to be manifest. And we feel ourselves falling with them.